Ola Pakoda is mostly prepared using Besan and Rice flour. In my family circles we use roasted gram (pottuk kadalai) flour instead of besan (kadalai maavu) flour. This gives slightly different taste and would be liked by all. * Click here for Homemade Red Chilli powder Recipe. * Click here for Homemade Rice Flour Recipe. * powder the roasted gram into fine powder using dry mixie jar and then use. 1. In a bowl, add rice flour, besan flour, roasted gram flour, butter, red chilli powder, asafoedita and salt. 3. Add water little by little and make soft dough. Keep it aside for 5 mins. 4. Take the murukku press and choose the design ribbon/ola pakkoda achu (design). 7. Press the dough in the oil like circular layer to fill the oil. Should not add more than one layer. 10. Take it out from the oil and drain it using the tissue paper. Repeat this for remaining dough also. Allow it to cool down completely and store it in an air tight container for later use. 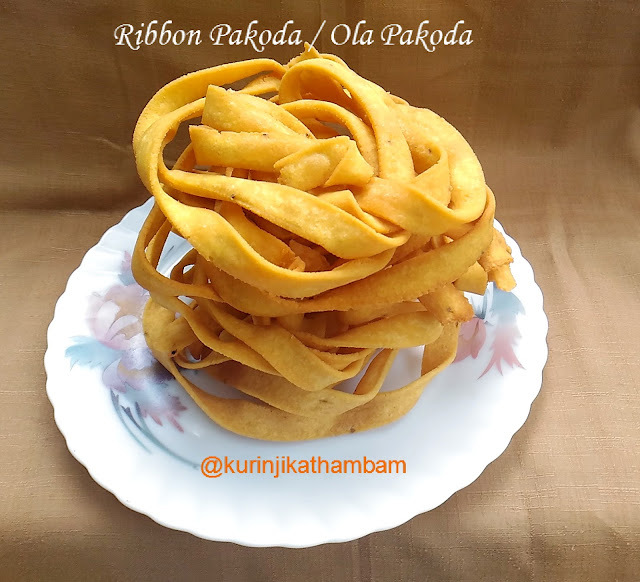 Tasty and crispy ribbon / ola pakoda is ready. Looks perfect .... nice presentation. ... !! !